Increases Cellular Respiration - When Cellfood is mixed into water, an exothermic reaction takes place providing oxygen and hydrogen to the individual cells of the body. The steady flow of oxygen and hydrogen to all parts of the body allow for simultaneous oxygenation and reduction within the cells. Cellfood users report recovering from respiratory and allergy related conditions such as asthma, sinus and upper respiratory infections. Energy Boosting Properties - With the increased energy reserves that Cellfood imparts, there is a gradual but significant detoxification of cellular wastes, allowing the body to function clean and efficient, further increasing energy levels over time. The trace elemental support of the digestive, nervous and endocrine systems, also contributes to overall increased energy, relief from allergies, and decreased sleep requirement reported by many people using Cellfood. Detoxifies the Body Deeply- After the energy potential in the body is increased, the natural mechanism in the body increases metabolism of waste material eliminating built-up toxins and poisons out of the body. Metabolic Efficiency Catalyst - Cellfood enhances nutrient absorption and increases metabolism. Cellfood users absorb more nutrient value from the foods and supplements they consume, because the trace mineral activated enzymes (both digestive and metabolic enzymes) work more efficiently. The strong catalytic activity of Cellfood allows for dosage reduction with drug therapy and promotes greater nutrient absorption and availability of vitamins, minerals, herbs, and other nutrient factors. Balances the Body Metabolism - Cellfood is highly charged electrostatically and its dibase solution has a bipolar valence, creating a dualistic healing approach to tissue imbalances. Meaning that whether there is an anabolic or catabolic imbalance, the Cellfood can bring about an appropriate balance and activate the body's rapid healing response. Powerful Free Radical Scavenger - Through its "water splitting" technology Cellfood enables nascent oxygen to be generated. Nascent means newly born; and, in biochemical terms, a newly born singlet atom of oxygen is negatively charged (0-). Free radicals (which many biochemists believe are the primary cause of the aging process and degenerative disease) are positively charged singlet atoms of oxygen (0+). The nascent oxygen atom (0-) is attracted to the (0+), forming a molecule of pure oxygen (02) at cellular level where it is needed, for processes such as cleansing cells, e.g. combining with a single carbon atom to form carbon dioxide (C02), which is expelled through the respiratory system. This is especially noticeable, for example, with patients who use it when they require chemotherapy and/or radiation. These patients report that they have fewer or no side effects. The results are especially good with nausea, weight loss, and hair loss. The world's #1 selling oxygen supplement - with 129 nutrients! 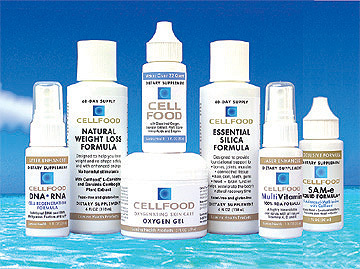 Cellfood is an unique, proprietary ionic formula containing dissolved oxygen, 78 ionic minerals, 34 enzymes, and 17 amino acids - and features an exceptional water-splitting cell-oxygenating process. Only Cellfood is capable of delivering these elements to every single cell. Recover Faster From Injuries - Cellfood acts as a free electron donor, repairing tissue on contact at the cellular level. People using Cellfood topically report very satisfactory results with warts, moles, other skin anomalies, athlete's foot, fingernail and toenail fungus, diabetic ulcers, and skin cancer. It cauterizes and disinfects wounds instantly. Painful paper cuts heal in hours. Great For Treating Water - It was first developed in 1956 to make drinking water for the military. The powerful bacteriostatic and flocculating effects of Cellfood can be witnessed by adding two drops of Cellfood to a gallon of water and setting the mixture aside for four to eight hours. The result is clean drinking water. Produces Extraordinary Results - There is no secret behind the value of trace minerals and micronutrients. The secret of the effectiveness of Cellfood is the physics involved in capturing, combining, and concentrating these elements into one easy-to-take drop in a glass of water. Because the elements in Cellfood are in a special ionic form in colloidal suspension, Cellfood is designed to replenish proper blood levels of these nutrients and enhance the metabolic benefit of other supplements and nutrients, as well as assist in the elimination of toxins and toxic waste materials from the body. Balancing The Body's System - When we speak of balancing a person, we refer to all the systems, such as physical, electrical, chemical, biological, intellectual, emotional, psychological, spiritual, ethereal, metaphysical, and so on. Cellfood is remarkable because it works at balancing a person on all these levels. Examples of this are: Cellfood works at the physical level by providing the body with essential minerals for the constitution of the physical body; it works at the electrical and electro-magnetic levels by increasing the vibrational frequencies of all the body organs, boosting the immune system, and enabling the nervous system to function more effectively; it works at the biological level by enhancing natural biological processes, e.g. digestive and metabolic processes in the body (because of enzymatic action); and it works on the chemical level by supplying amino acids to the body for building protein. Furthermore, because of the amazing proprietary formulation of Cellfood although it is prepared in a very acidic solution, pH 0.3, as soon as it makes contact with the enzymes in the saliva, it converts and neutralizes the fluids in the mouth into about pH 7.0. Tests with litmus paper have shown that whether one is acidic or alkaline, Cellfood immediately balances and normalizes the body pH. Strengthen The Immune System - Apart from assisting with the cleansing of cells, Cellfood raises the frequencies of all organs, making them more resistant to the lower frequencies of viruses, bacteria, parasites, etc. When the "water splitting phenomenon' takes place, the nascent hydrogen atoms contain enormous supplies of positively-charged electromagnetic energy. One drop of Cellfood produces 77,000 angstroms of energy. The body is encharged by this hydrogen. In 1991, Dr Aristo Vojdani, Vice-President of Immunosciences Laboratories Incorporated U.S.A. reported, "significant increases in T-cells with increasing dosages of Cellfood". This means that as the immune system is being progressively boosted, it makes the body more capable of dealing with micro-organisms that could be detrimental to one's health. The information provided through CellfoodCenter.com should not be used for diagnosing or treating a health problem or a disease. It is not a substitute for professional care.